​Roof Certification Inspection: This is a report that requires photos and is required on new insurance policies to document for the insurance company on the condition of the roof, how old it is, and how much longer it can be expected to last. What's Included with your insurance Roof Inspection? ​Determination of your home's located. Is it on a High Velocity Hurricane Zone (HVHZ)? Permit search or permit history investigation for roof history and inspections. Determination of roof age and what kind of material the roof was built with. Determination of roof material to make sure it meets the Florida Building Code or Miami-Dade Product Approvals. Access the attic to determine Roof Deck type, Roof Deck attachments (sheeting), measure the size of nails and use special equipment to determine the spacing of the nails. Determine what kinds of Roof-to-Wall attachments there are. 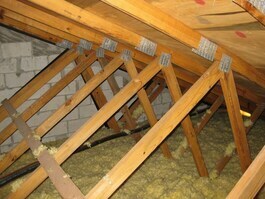 Is it toe nails, clips, single straps, or double straps and how they are securing the roof. We make sure they are well installed. We look at the Roof Geometry and advise any retrofits that you can do to make your roof more secure against wind storm. We take pictures and include all the pictures required by your insurance company with your report. We DO NOT perform Roof Repairs. Therefore, rest assured that we have no interest in doing any work in your home or business. In fact, people use us to verify that their roofers did the work right. What else do you get from your TRUSTED Certified Home Adviser? Licensed and Insured - Professional Company. Honest and unbiased Home Inspection Report. Performed by former General Contractor with 15 years of experience. Thermal Imaging or InfraRed Camera Technology. Weekend and holidays* appointments available. Same day or after after hour* inspection report available. State of the art video and paperless technology. On-Line Quote and Scheduling 24/7. Residential Warranty Included upon request. Discount Price when bundled multiple inspections. 11 Month or Builders Warranty Inspection. Swimming Pool or SPA Inspection.